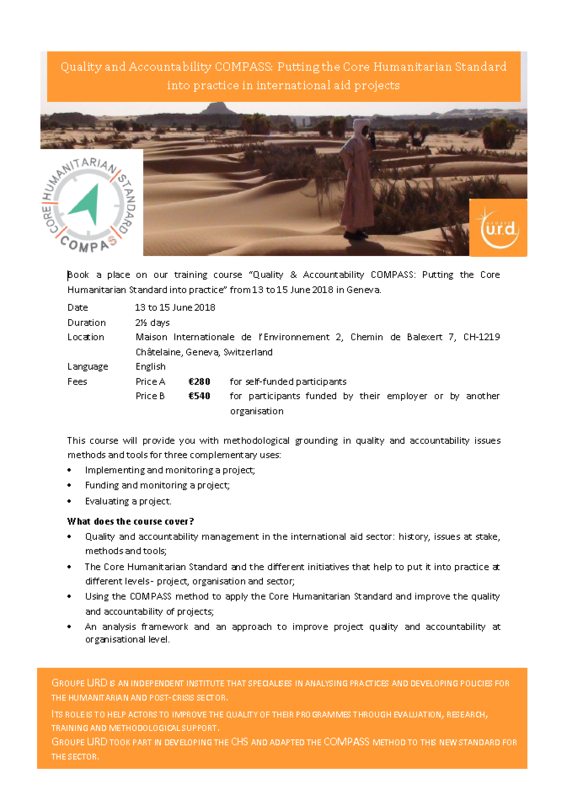 Groupe URD will be running two training sessions entitled 'The Quality and Accountability COMPASS: implementing the Core Humanitarian Standard on Quality and Accountability (CHS) in international aid projects'. The first of these will be in English and will take place in Geneva, Switzerland, on 13, 14 and 15 June. The second will be in French and will be held in Paris, France, on 29, 30 and 31 October. These training sessions aim to reinforce the capacity of individuals and organisations to conduct projects responsibly (1) and to meet the needs and expectations of communities and people affected by a crisis (2). It is aimed at professionals from the international aid sector who are involved in implementing, funding, monitoring or evaluating humanitarian projects, such as Heads of Project, staff in charge of monitoring funds and partnerships, staff in charge of Planning, Monitoring, Evaluation, Accountability and Learning (PMEAL), evaluators, etc.